DETROIT -- Detroit Red Wings rookie defenseman Dan DeKeyser met with reporters this past weekend, just a day after choosing to play for the team he grew up watching. He answered a litany of questions with no problem, but when it came to why he chose to wear No. 65 with the Red Wings … well, that's when it got fun. "They gave me a few different numbers to pick from, so it was kind of a random pick, I guess," DeKeyser said. "It had a 5 in it." Turns out that for most of his career -- from youth levels all the way up through college -- the undrafted late-bloomer from Macomb, Mich., had worn the No. 5 on his back. "Do I have to ask why you wore that particular number so often?" a reporter asked him. DeKeyser blushed. He then shook his head and flashed a wide smile. "I don't think you do," he said. "But I think you know who my idol was … so I don't have to say." His "idol" just happened to be walking through the Red Wings' locker room at the time. Legendary former Red Wings defenseman and captain Nicklas Lidstrom was visiting with former teammates and looking just about the same as he did a year ago -- before opting to retire last June after a remarkable 20-year career and return to Sweden with his wife and kids. As luck would have it, "The Perfect Human" brought his family back to the United States for a vacation this past week and made sure to swing by Joe Louis Arena for a practice and Sunday's game against the Chicago Blackhawks -- which didn't go so great after a 7-1 Detroit loss on Gordie Howe's 85th birthday. 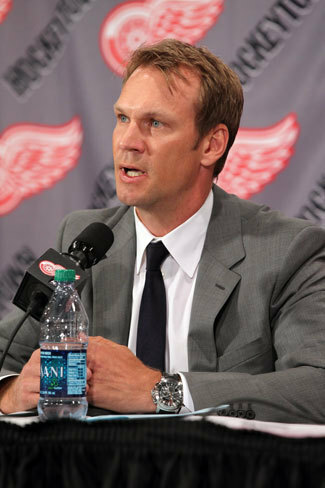 Lidstrom also squeezed in a recruiting phone conversation that helped reel in DeKeyser for Red Wings general manager Ken Holland and even found some time for reporters -- who not only wanted to say hello, but also pick his brain. What did you say to Dan DeKeyser when you spoke to him on the phone? How did you end up on the phone with him? 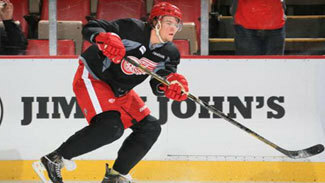 It was only one practice, but what did you think of DeKeyser from what you saw on the ice? What do you think of Tomas Holmstrom as a youth hockey coach here in suburban Detroit? So, what have you been up to over in Sweden? Do you miss this, the NHL? What brought you back this time? What do you think of the Red Wings going to the Eastern Conference? Would you have continued playing if they'd moved earlier? What do you think of Calle Jarnkrok, one of the Red Wings' top forward prospects? Have you seen him play? He gets compared to Henrik Zetterberg sometimes by the Red Wings front office. Do you see that, too? Do you think he's pretty close to playing in the NHL?